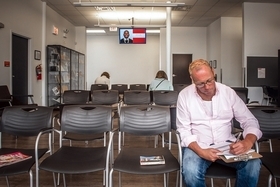 A patient fills out at forms Howard Brown Health Clinic in Rogers Park, one of many providers who serve Medicaid patients in Illinois. The Rauner administration in Illinois has finalized contracts with seven private health insurers that could cost the state up to $15 billion a year as he overhauls a major Medicaid cost-saving initiative. The new program, called HealthChoice Illinois, will launch on Jan. 1. "This transformation will offer quality care to vulnerable residents while ensuring sustainable costs for taxpayers," John Hoffman, a spokesman for the Illinois Department of Healthcare and Family Services, said in a statement. In managed care, the state pays private insurers to administer benefits to Medicaid beneficiaries with a focus on prevention. The goal is to make recipients healthier, therefore lowering costs for the state. Gov. Bruce Rauner's revamp involves expanding managed care statewide while working with fewer insurers. The program, which now covers about 63 percent of the state's 3.1 million Medicaid recipients, will increase to at least 80 percent. Medicaid members are now receiving letters about choosing a health plan for 2018. Further privatizing managed care has prompted blowback from critics who say the procurement process, believed to be the largest in the state's history, wasn't transparent enough. Some state lawmakers have been pushing legislation to no avail that would hold insurers more accountable for the treatment they provide and the public dollars they receive. One of the winners, IlliniCare, sent shudders through medical suppliers recently after announcing it was cutting reimbursement rates by up to 50 percent, fueling questions about if patients would be left in the lurch. While HealthChoice is projected to be more expensive in 2018—the state now spends about $10.5 billion on managed care—the program is estimated to save Illinois $200 million to $300 million a year, or roughly $1 billion over the initial four-year terms of the contracts. That's largely due to insurers agreeing to be paid less by the state. The following insurers won new contracts: Blue Cross & Blue Shield of Illinois, the dominant carrier in the state; CountyCare, a health plan run by the Cook County Health & Hospitals System; Chicago-based NextLevel Health founded by Dr. Cheryl Whitaker; and the following insurers affiliated with national or regional carriers: Harmony Health Plan, IlliniCare, Molina Healthcare and Meridian Health. It's not clear how much each insurer will make. That will be based on how many Medicaid recipients enroll in their plans. Hoffman says the new program will hold insurers to higher quality standards and monitor them more closely. In July, Crain's found that insurers were doing a poor job of tracking down and working with Medicaid recipients who chose them or were assigned to them. Rep. Greg Harris has convened a public hearing tomorrow in Chicago in part to learn how insurers won contracts and why the estimated cost of the agreements have fluctuated. "There are still tremendous unanswered questions," said Harris, a Chicago Democrat. "Rauner finalizes $15 billion Medicaid overhaul" originally appeared in Crain's Chicago Business.